TIP: Shred the sweet-potatoes to dry them up quickly. TIP: Soak the sword beans in water for over 10 hours. TIP: Put enough water to boil the ingredients. TIP: Boil the ingredients hard until the sweet-potatoes become tender and yield completely. TIP: The black rice helps improve the flavor of the porridge. TIP: Keep stirring the ingredients while boiling them. 1. Shred sweet-potatoes and dry them up. 2. Boil the dried sweet-potatoes hard, together with sword beans and black rice. Rich in anthocyanins that have antioxidant properties, sweet-potatoes are highly effective in preventing aging, adult diseases and cancers. 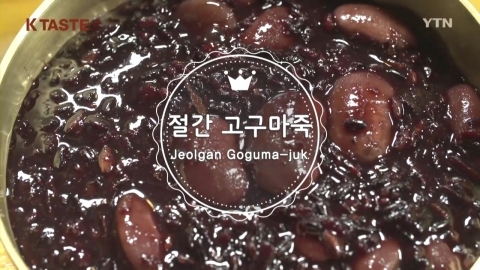 Here is the special winter dish 'Jeolgan Goguma-juk' (Dried Sweet-potato Porridge).